Twenty-three community leaders participated in the First Central Luzon Peace and Reconciliation Catalyst Seminar, held in Cabanatuan City last March 23, 2010. This is part of PeaceBuilders Community’s PAR Team Organizing extension in Luzon–the northern island of the Philippines. 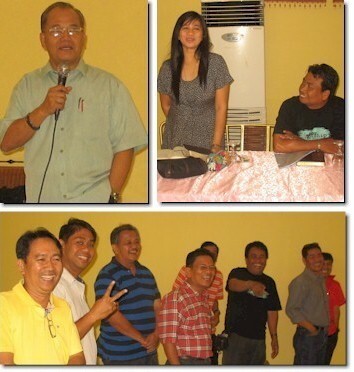 These participants are leaders of the Association of Ministers and Ministries in Nueva Ecija (AMMNE). They are bishops, pastors, family-life counsellors, professors, doctors and civil society executives. Bishop John Tayoto and his staff from the Asian Center of Leadership and Education coordinated this event. AMMNE envisions to invite, train, organize, and mobilize a Peace and Reconciliation Team (PAR-T) from a group of provincial leaders who would, in turn, invite, train, organize, and mobilize PAR-Ts in various municipalities in Nueva Ecija. Most of these teams would be specializing in Disaster Preparation and will be field-tested in strategic communities in Central Luzon. The training and preparation will include various skills in responding to both natural and man-made disasters. PeaceBuilders Community aims to help increase the disaster preparedness of our partner communities in key areas of Central Luzon. In order to achieve our goal, (a) we have to increase the capacity of our local community partners to respond to disasters caused by natural hazards and conflict; and, (b) we have to increase local disaster coordination among related agencies present in partner communities. This PAR-T organizing in Central Luzon is done in partnership with the Mennonite Central Committee, Peace Mennonite Church, Mennonite Church Canada, Coffee for Peace, Philippine Council of Evangelical Churches, and the Integrated Mennonite Churches in the Philippines. I’m interested to know more about being a catalyst, please tell more bout the details. I know somebody who is involved in this but as of the moment I prefer not to mention his name yet. I’m also a concerned citizen who would like to get involved in promoting a peaceful, disaster-free country. I guess your program helps alot.